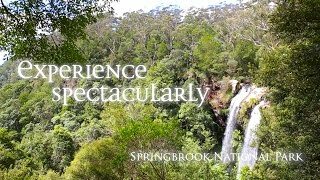 Springbrook National Park has breathtaking lookouts, magnificent waterfalls, dense rainforest and ancient Antarctic beech trees. The park is part of Gondwana Rainforests of Australia World Heritage area. Venture through a thick forest of elaborate Antarctic beach trees, one of the remaining links to the ancient forests of Gondwana, to spectacular views of northern New South Wales. The view is dominated by Mount Warning, an ancient extinct volcano.